In February 2017 Manurewa Library celebrates its 50th anniversary. 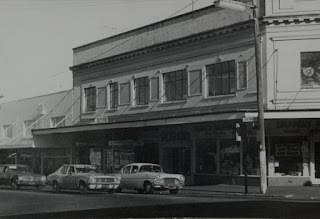 On 20 February 1967 it was opened on the first floor of the Natali Buildings on the corner of Great South Road and Station Road. It was Manukau City Council’s first full-service free public library. Ref: The Natali's Buildings, c1979, South Auckland Research Centre, Auckland Libraries, Footprints 01617. Known as Pegler’s Building when it was opened in June 1930, this originally housed seven shops on the ground floor and a reception room or hall, four offices and two flats on the first floor. In 1967 the reception room was converted into a library. Manukau City had been formed by the amalgamation of Manukau County and Manurewa Borough in September 1965. The only library service in the former county area at the time was a scattering of mostly volunteer-run ‘B’ libraries in places like Clevedon, Alfriston, Māngere East and Weymouth (where the noted New Zealand writer Roderick Finlayson served as librarian). The former Manurewa Town Board had supported a small subscription library between 1918 and 1929, since which there had been no public library in Manurewa at all. Bernice Hynes (later Davies), a qualified librarian who had most recently served as librarian for the Cook Islands Library & Museum Society, was appointed the first Manurewa Librarian. Besides setting up the Manurewa library, she helped establish children’s libraries in Ōtara and Māngere East. 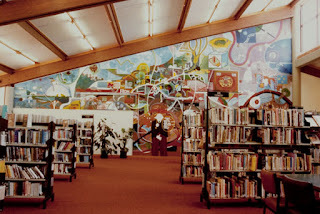 Ref: Interior, Manurewa Library, c1979, South Auckland Research Centre, Auckland Libraries, Footprints 02684. The first Manurewa library was accessed by a steep and narrow flight of stairs. The interior was cramped and crammed with books. But it was sunny, and Bernice Davies recalled during an interview in 2010: “They had a gorgeous window that was on the diagonal in the corner, and we thought, ‘Oh, children’s corner …’” There was just enough room to hold some inventive children’s programmes and activities (MNP OH44, 2010). The Manurewa area saw rapid growth through the 1960s and 1970s. In 1974 Manukau City Council approved plans for a new community centre between Hill Road and Halver Road. This was to include a ward office, library, Citizen’s Advice Bureau and lettable commercial space. 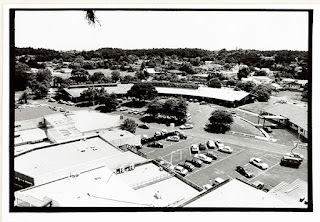 The library opened for business in its new location in May 1981; Mayor of Manukau Sir Lloyd Elsmore formally opened the entire $1,738,000 complex on 1 May 1982. By that time Natali Buildings had been demolished. Below is the Hill Road entrance to the new Manurewa library, 1983. The library’s community room and exhibition space is to the left, the main entrance lobby is straight ahead, a café is to the right. The striking and innovative building was designed by Kingston Reynolds Thom & Allardice Ltd.
Ref: Manurewa Library, 1983, South Auckland Research Centre, Auckland Libraries, Footprints 01552. The new library rapidly became very popular. In April 1982 alone 47,585 books were issued, compared to 32,687 in the old library’s last month of operation. The community and exhibition room became a centre of local social and artistic life. 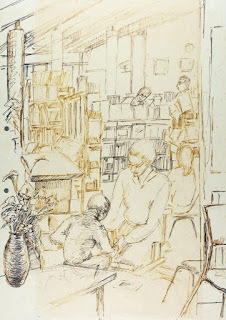 Local artists Harold and Kaye Knight held an annual exhibition of their work at the library during most of the 1980s. 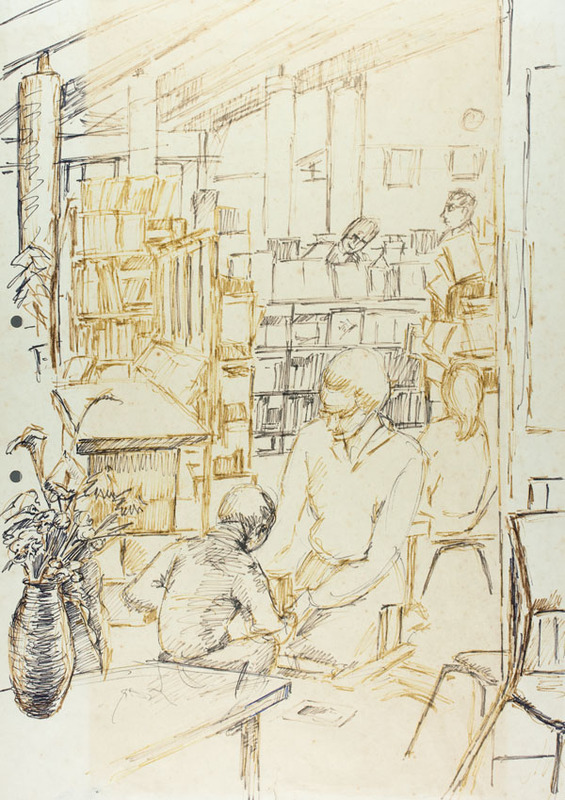 Ref: Harold Knight, Sketch of the interior of the new Manurewa library, c1981, South Auckland Research Centre, Auckland Libraries, Footprints 02740. The mural by local artist Tony Johnston depicted ‘Manukau as a large shellfish’. It was unveiled on 14 September 1983. This is the original form of the mural: the figure of a man seen in the lower panel was later repainted as being too scary for young children. Ref: Mural, Manurewa Library, 1983, South Auckland Research Centre, Auckland Libraries, Footprints 01560. This shot was taken from about 30 metres up the Norfolk pine outside Southmall (Manurewa’s famous ‘Christmas tree’). The curved building seen across Newhook Lane is the Manurewa Community Centre building, of which the library formed the central portion. The newly opened Trust Health Care building is to the far right. Ref: Doug Scott, View of Great South Road, December 1995, photograph reproduced courtesy of Manurewa Historical Society, South Auckland Research Centre, Auckland Libraries, Footprints 05326. 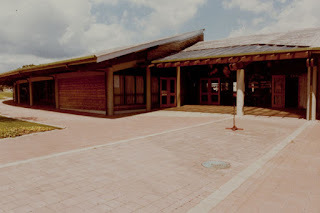 Manurewa Library remained a vital part of the growing Manukau City library service until 2010, and has been a vital part of Auckland Libraries since. 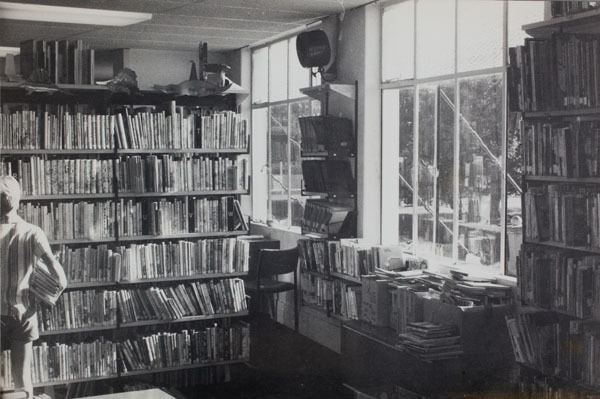 During the 1960's there was a rental library in an arcade in Station Road, Manurewa. A fabulous collection of books was covered in paper printed with advertising from local businesses, colour-coded by genre. I particularly remember science fiction and crime! An eagerly anticipated Friday night destination before collecting the fish and chips and crunchie bar.